^ a b c Hogarth, David George (1911). "Apamea s.v. 1" . Encyclopædia Britannica. 2 (11th ed.). p. 159. Antioch on the Orontes was an ancient Greek city on the eastern side of the Orontes River. Its ruins lie near the modern city of Antakya, Turkey, and lends the modern city its name. The Orontes or Assi is a northward-flowing river which begins in Lebanon and flows through Syria and Turkey before entering the Mediterranean Sea. A cardo was the Latin name given to a north-south street in Ancient Roman cities and military camps as an integral component of city planning. The cardo maximus was the main or central north–south-oriented street. Hama is a city on the banks of the Orontes River in west-central Syria. It is located 213 km (132 mi) north of Damascus and 46 kilometres (29 mi) north of Homs. It is the provincial capital of the Hama Governorate. 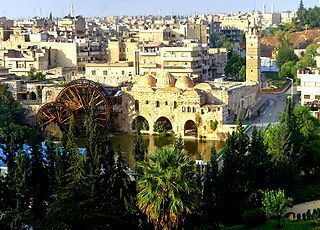 With a population of 854,000, Hama is the fourth-largest city in Syria after Damascus, Aleppo and Homs. Shahba is a city located 87 km south of Damascus in the Jabal el Druze in As-Suwayda Governorate of Syria, but formerly in the Roman province of Arabia Petraea. Known in Late Antiquity as Philippopolis , the city was the seat of a Bishopric, which remains a Latin titular see. Eleutheropolis was a Roman and Byzantine city in Syria Palaestina, some 53 km southwest of Jerusalem. Its remains still straddle the ancient road connecting Jerusalem to Gaza and are now located within the Beit Guvrin National Park. Pessinus was an Ancient city and archbishopric in Asia Minor, a geographical area roughly covering modern Anatolia on the upper course of the river Sangarios, remaining a Catholic titular see. Cherchell is a town on Algeria's Mediterranean coast, 89 kilometers (55 mi) west of Algiers. It is the seat of Cherchell District in Tipaza Province. Under the names Iol and Caesarea, it was formerly a Phoenician, Carthaginian, and Roman colony and the capital of the kingdoms of Numidia and Mauretania. Alinda was an ancient inland city and bishopric in Caria, in Asia Minor (Anatolia). Nabeul is a coastal town located in north-eastern Tunisia, on the south coast of the Cape Bon peninsula and entoured by the Mediterranean Sea on both sides. It is the first seaside resort in Tunisia. It is known for its agricultural riches and its touristic potentials. Pella is an ancient city located in Central Macedonia, Greece, best known as the historical capital of the ancient Greek kingdom of Macedon and birthplace of Alexander the Great. On the site of the ancient city is the Archaeological Museum of Pella. Aigai, also Aigaiai was an ancient Greek, later Roman, city and bishopric in Aeolis. Aegae is mentioned by both Herodotus and Strabo as being a member of the Aeolian dodecapolis. It was also an important sanctuary of Apollo. Aigai had its brightest period under the Attalid dynasty, which ruled from nearby Pergamon in the 3rd and 2nd century BC. Cyrrhus is a city in ancient Syria founded by Seleucus Nicator, one of Alexander the Great's generals. Other names for the city include Hagioupolis, Nebi Huri, Khoros. A false etymology of the sixth century connects it to Cyrus, king of Persia due to the resemblance of the names. The former Roman/Byzantine (arch)bishopric is now a double Catholic titular see. The Art & History Museum is a public museum in Brussels, Belgium which is one of the constituents of the Royal Museums for Art and History. It is located in the Cinquantenaire park. It was known as the Cinquantenaire Museum until May 2018. It is one of the largest museums in Europe. Baniyas is a city in Tartous Governorate, northwestern Syria, located 55 km south of Latakia and 35 km north of Tartous. Umm Qais or Qays is a town in northern Jordan principally known for its proximity to the ruins of the ancient Gadara, also a former bishopric and present Latin Catholic titular see. The Roman Theatre at Apamea is a Roman theatre in ancient Apamea in northwestern Syria. Originally a Hellenistic theatre, the monumental structure was one of the largest theatres in the Roman world. 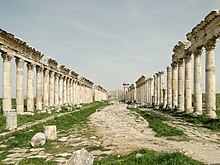 The Great Colonnade at Apamea was the main colonnaded avenue of the ancient city of Apamea in the Orontes River valley in northwestern Syria. It was built in the second century CE after Apamea's devastation in the 115 earthquake. The avenue, which runs for nearly 2 kilometres (1.2 mi), made up the city's north-south axis, or the cardo maximus. The monumental colonnade is among the longest and most famous in the Roman world.